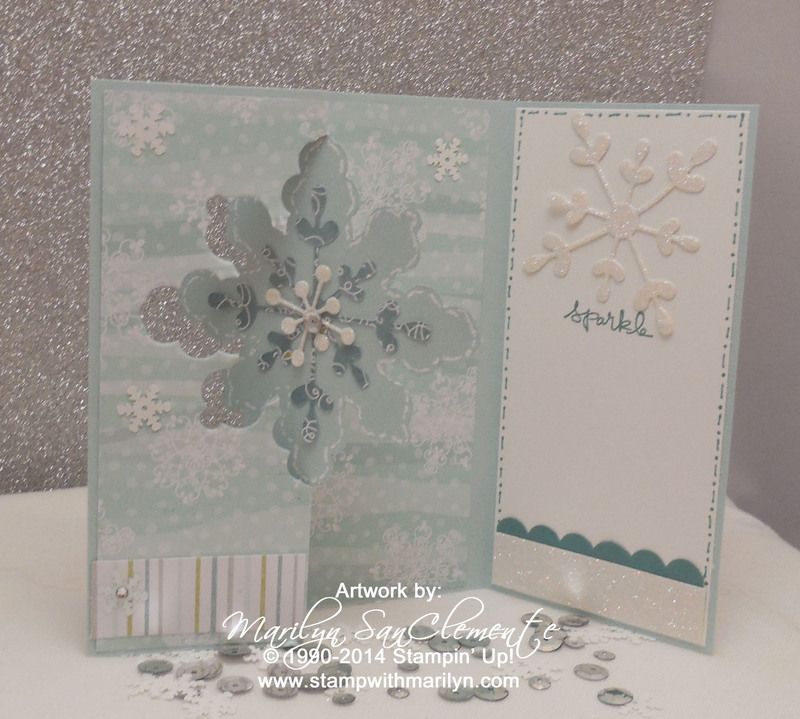 I love the snow scene look of the All is Calm designer paper. And Holiday papers with the blue tones are always my favorite! I didn’t think that Stampin’ Up! could top last years Holiday designer paper in the blue tones, but they have with this combination of patterns using soft sky, lost lagoon, smokey slate – which coordinates great with the Silver Glimmer paper and pear pizazz. The Card Details: The soft sky cardstock is cut at 5 3/8″ x 8 1/2″. The designer paper is cut at 5 1/4″ x 5 1/2″ to layer over the fold of the card. These are lightly adhered together and then run through my die cutting machine with the Snowflake Card Thinlits. Once I run this through the machine and fold the card, I added a little more snail to the points of the snowflake and around the snowflake to better adhere the designer paper. Once you fold the card, the side with the snowflake with the designer paper is on back. I carefully cut out the snowflake and cut just a snowflake from whisper white using the thinlit die. Need some help with this technique? 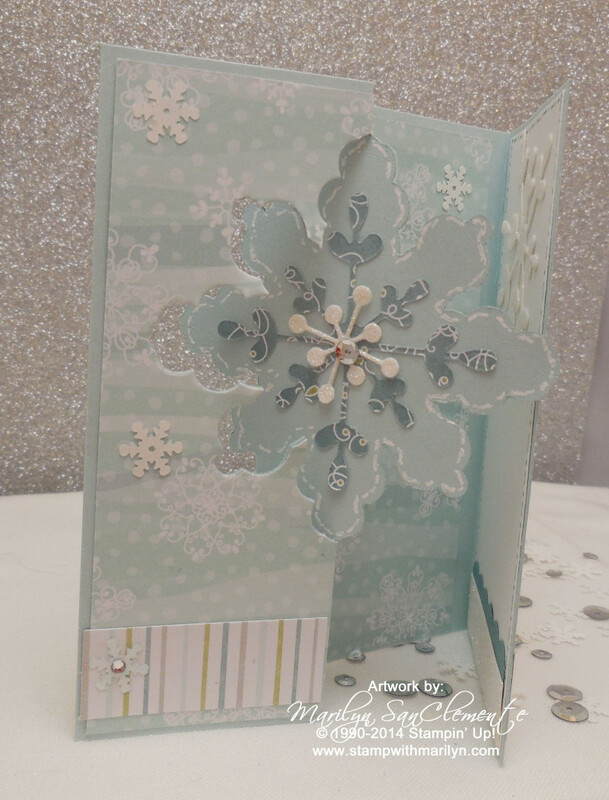 Check out my VIDEO HERE on how to use the thinlit die to cut the card base and a second white snowflake. 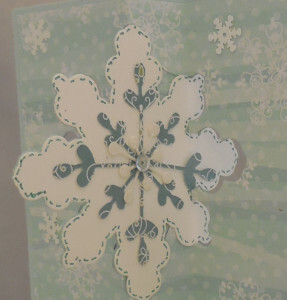 I used the medium snowflake die to cut 2 snowflakes from the lost lagoon designer paper and 2 small snowflakes from the Dazzling Details Glimmer paper. These are layered on each dies of the flip portion of the snowflake. A silver sequin is added to the center of the smaller snowflake from the Frosted Sequins embellishments. On the inside flap of the card, I us ed a piece of 2 3/8″ x 5 1/4″ whisper white cardstock to layer on the inside flap of the card. I added a small strip of dazzling diamonds glimmer paper along the bottom with a scrap of Lost Lagoon cardstock with a scalloped edge made with the scallop edge punch. 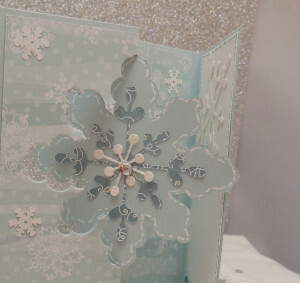 At the top of the piece I added the medium snowflake cut from Dazzling Diamonds Glimmer Paper. The word Sparkle is stamped with Lost Lagoon ink. As an added touch, I did some faux stitching around the large snowflakes. On the front soft sky side, I used my white pen to stitch around the edge of the snowflake. When you flip open the card, the inside of the snowflake and the white panel are stitched with my Lost Lagoon marker. Last but not least I added some of the sequins from the Frosted Sequins embellishments randomly on the card. You can start ordering from the New HOLIDAY catalog on Thursday August 28th. Handmade Christmas card, Handmade Holiday cards. Bookmark.